Fixed speed cameras in Swindon have been switched off, making the borough council the first English local authority to abandon their use. The town has five cameras, which are being covered over during the day. The Conservative council said they cost about £320,000 a year to maintain and very little of the revenue generated is returned by central government. 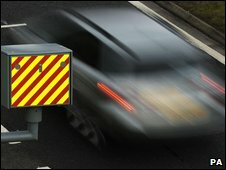 Wiltshire Police support speed cameras and are "especially pleased" that mobile units will continue to operate. Deputy Chief Constable of Wiltshire Police David Ainsworth said: "Cameras are an effective means to help achieve a reduction in deaths and injuries and, as such, are an invaluable part of our casualty reduction strategy and they will continue to be used. "I am especially pleased that the council... will continue as normal in their mobile speed camera enforcement across Swindon where necessary. "Any assumption that speed cameras will no longer be used in Swindon is plainly incorrect." The Royal Society for the Prevention of Accidents (Rospa) and South Swindon Labour MP Anne Snelgrove are both against the move. And road safety charity Brake said it "wholeheartedly opposed this reckless decision". One of the cameras is on Queens Drive, with two on both Oxford Road and the A420. The cameras will be replaced by vehicle-activated warning signs. Swindon Conservative Councillor Peter Greenhalgh said: "In Swindon we are developing a reputation for challenging the status quo and being at the forefront of new thinking. "Our sole aim is to find new and more effective ways to reduce road accidents within our current budget."